Some clarity was achieved a week ago, with the Rams, Chiefs, Patriots and Saints winning and covering, while the Cardinals, Giants, 49ers, Browns, Bills and Raiders all losing (in the latter case, at least spiritually). The Chargers had to eek out a win overseas and might have a case to make the top five going into their bye, but we’re going to be prohibitive for now. 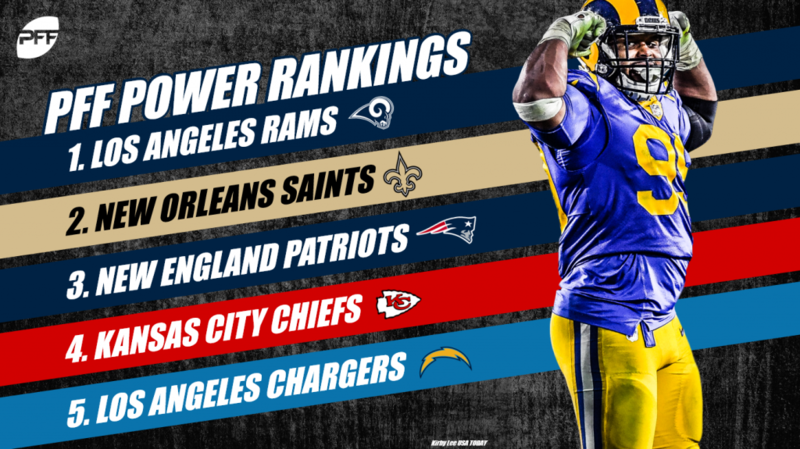 There are only four or five truly elite teams in the NFL, and you can make a case that the Rams are even a tier above that group. We have them projected at 12.48 wins going into week 8, with a 16.4% chance to win the Super Bowl, the highest in the NFC. What a big win by the Saints last weekend, coming back from a 10-point road deficit to win against what is largely considered the league’s best defense. 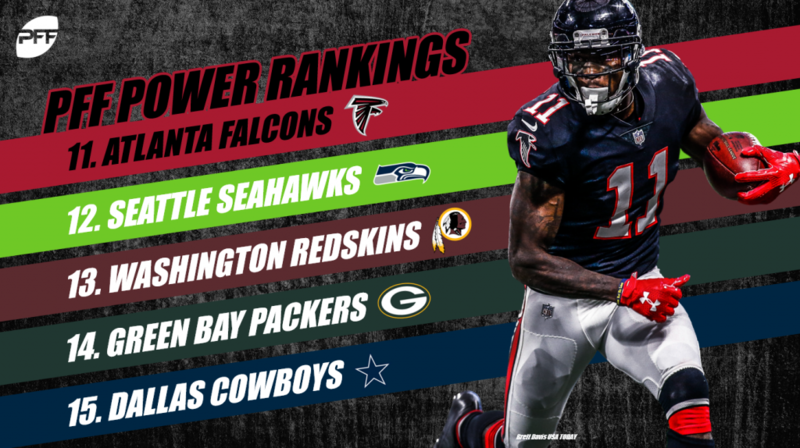 While there are still some concerns about their secondary (they are 31st in our coverage grades and needed to trade a fourth-round pick for a failed first rounder at corner this week), they remain a decided favorite to win the NFC South (69.4%), the best division in football. Death, taxes, and the New England Patriots being favored to win the Super Bowl after a slow start to the season (19.4%). They have an easier road in the AFC, and seemingly only have the Chiefs (whom they’ve already beaten) to contend with. While they are used to Tom Brady being the highest-graded player at his position, this year he is only sixth, so could they be in for an even bigger elevation in the coming weeks? The Chiefs, by virtue of a hot start on the tough part of their schedule, are second in total projected wins after week 7 (11.77). While the next three (versus the Broncos, Browns and Cardinals) should help the Chiefs and their lowly defense continue to improve, their date with the Rams in a few weeks, one where we have them slightly favored, could go a long way towards determining (again) if they are the frontrunner to win the Super Bowl in 2018. Despite their close call in London, the Chargers are one of the low-key good teams in the NFL, and a reason why the Chiefs division win probability is near 80% and not 90% like the Rams and Patriots. Their only two losses are to the Rams and Chiefs, and they have just the 19th most-difficult schedule in terms of PFFELO moving forward. Watch out for the bolts. It wasn’t pretty, but by virtue of two losses in three games by the Ravens and two straight losses by the Bengals, Pittsburgh is in the driver’s seat in their division, with a 52.9% chance to take it home. Their defense has improved of late, allowing fewer than 325 total yards the last two weeks and exactly 62 on the ground per game in that timeframe. While it looked like the North was going to be a more fun group this season, there’s now a chance it will be as boring an affair as it was in 2016 and 2017. As the Bengals before them, the Ravens missed a golden opportunity this week at home against one of the league’s better teams. They are still a frontrunner to make the AFC playoffs (55.6%) and have historically been a pest when they get in. However, as Sunday demonstrated, a team built on defense (seventh in our grades) instead of offense (17th) is going to be behind the eightball in today’s NFL. They have a big one in Charlotte this week that will go a long way towards determining which one of these teams is for real moving forward. After sputtering to a 1-2-1 start, the Vikings have rebounded with three consecutive wins on the back of the league’s most-valuable non-quarterback in Adam Thielen (who has been worth about half a win above replacement so far this year). 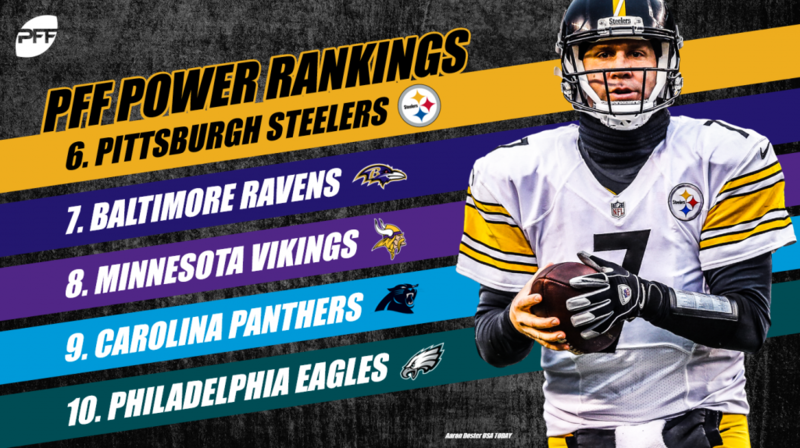 While they are currently the favorite to win the NFC North (and a good value at -110 if you want to bet it), we’re shying away from putting them with the truly elite teams, as wins against the 49ers, Eagles, Cardinals, and Jets do not constitute the most-impressive resume to date. The Panthers put together a late rally, securing a big victory on the road against the defending super bowl champs. From an EPA standpoint, Cam Newton had his best performance of 2018. At 4-2 the Panthers have some ground to make up on the Saints, but with an expected win total of nine games, our model has them making the playoffs 45% of the time. Showing once again how unstable defensive performance can be from year to year, the Eagles let the Panthers score 21 fourth-quarter points and eventually lost at home. The Eagles have struggled defensively allowing 50% of pass attempts to be successful on early downs. The Eagles have been atrocious defending the pass when applying pressure and have allowed the fourth-highest passer rating in this situation. At 3-4, the Eagles have some ground to make up if they want the opportunity to defend the Lombardi trophy in the playoffs. Our model still has them winning the NFC East 32% of the time and making the playoffs around 40% of the time. Atlanta survived a showdown on Monday night with the worst team in football but failed to cover again in what is becoming a common theme for them in 2018. At 3-4 and with an expected win total of eight games, they are quickly losing sight of the Saints at the top of the NFC South. The Falcons have a mere 8% chance of winning the division and have some work to do if they want to make the playoffs. Matt Ryan is among the league leaders in EPA generated per passing attempt. With an early down successful pass rate of 57%, it is a wonder why this team even bothers running the ball outside of the red zone. The Seahawks return from their bye staring up at the best team in the NFL in their division. Even at 3-3, we have their odds of winning the NFC West at less than 5% chance. They do have their work cut out for them if they want to make the playoffs with a 34% chance of sneaking into a wild card spot. Defensively, they have played better than expected and have allowed a neutral EPA on early down passing attempts. If this holds steady in the latter part of 2018, they will definitely be playing meaningful games in late December. The Redskins squeaked past the Cowboys at home on Sunday improving their record to 4-2 overall and 3-1 in the NFC East. Alex Smith continues to be adequate but is far removed from the deep passing performance he put together in 2017 for the Chiefs. The Redskins do have a successful pass attempt on 50% of early down attempts, which has helped them keep the chains moving. They are sitting atop the NFC East and currently have over a 50% chance of winning the division with an expected win total slightly over nine games. The Packers come out of their bye with a hopefully healthier version of Aaron Rodgers and his receivers. Rodgers has been playing well in 2018 but is not at the elite level we have seen him at previously. He will need to return to MVP type performances if the Packers want a shot at winning on the road against the Rams and Patriots in subsequent weeks. Because of their brutal remaining schedule, we currently have the Packers with a 12% chance of winning the division with matchups looming on the road games against the Vikings and the Bears. Their playoff chances are hovering around 28%. The Cowboys fell victim to a snap infraction resulting in a missed field goal that would have sent their game against the Redskins into overtime. After a slow start to the season, Dak Prescott appears to be playing much better of late. He still has a negative EPA per dropback but has finally posted two straight games with a positive EPA in weeks 6 & 7. They head into their bye ready to break in their new number one receiver Amari Cooper. His presence will hopefully elevate the play of Prescott and improve their chances of making the playoffs. At 3-4 we have their current probability at a 21% chance of sneaking into the postseason. The Titans almost stole one from the Chargers in London on Sunday, but their two-point conversion attempt was knocked away. 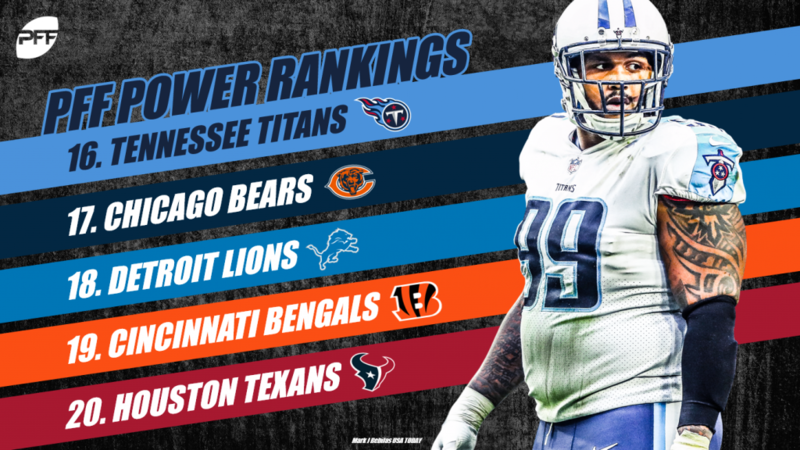 Heading into their bye, the Titans find themselves on the outside looking in at the playoff race taking shape. The AFC South is absolutely brutal, but with an expected win total of 7.5 games, we give the Titans slightly more than a 30% chance of winning the AFC South. The Bears gave the Patriots a brief scare on Sunday but inevitably fell just short in their comeback attempt. Mitchell Trubisky continues to provide what is asked of him but offers minimal upside related to his passing production. If the Bears want to beat a team like the Patriots, they have to play better defensively than they did on Sunday. After playing well to start the year, they have now surrendered a successful pass on almost 50% of early down attempts. Their neutral EPA allowed in this situation is third in the NFC. The Lions beat the Dolphins in Miami behind the strong rushing production provided by Kerryon Johnson. Johnson averaged 4.89 yards after contact per attempt on Sunday. At 3-3 the Lions have a long ways to go in a tough NFC North if they want to make the playoffs. Currently, our model gives the Lions a little over 25% chance at the playoffs in 2018. After a hot start to 2018, both Andy Dalton and the Bengals have stumbled in their last two matchups. The Bengals defense looked overmatched trying to slow down the Chiefs offense. Even more surprising and concerning is the complete lack of success the Bengals offense had on Sunday. Dalton had by far his worst game in 2018. This team will go as far as Dalton can take them, but judging by his performance on Sunday, that may not be nearly as far as we once thought. Deshaun Watson was effective in his performance against the Jaguars, securing the victory and putting the Texans in first place in the AFC South. Watson has twice as many positively graded throws to negatively graded throws. The only struggle in 2018 is his turnover-worthy throw percentage. With an expected win total of 8.5 games, the Texans are the odds-on favorite to win the AFC South with a 47% chance. Well, it was a quick fall from grace for the reeling Jaguars as they appear to be in complete disarray after suffering a home loss to the Texans on Sunday. Blake Bortles was benched in favor of Cody Kessler as we officially have a midseason quarterback battle underway in Jacksonville. After trading for their third generational talent at the running back position, it appears we also have a midseason running back battle underway with the return of Leonard Fournette now looking murkier than ever. The rematch that the entire world wants to see is taking place on Sunday, that is Brocktober verse his former Texans team. Brock Osweiler has been adequate filling in for Ryan Tannehill posting a passer rating when clean of 111.5. If they want to beat the Texans on the road on Thursday, it will require elite level play from the Dolphins defense. To date, they have not been up to the challenge allowing a successful pass on over 50% of early down attempts. The expectation is that Deshaun Watson carves this unit up on Thursday. The Broncos rode a dominating defensive performance overpowering the Cardinals on Thursday night. They looked like the Broncos defense of yesteryears, with 22 pressures recorded and a passer rating allowed of 45.7. It could be a short trip back to reality however as the Broncos are now tasked with slowing down the Chiefs juggernaut offense on Sunday. The Bucs survived an overtime thriller, knocking off the Browns on a 59-yard field goal. Since returning from suspension, Jameis Winston has performed well with an EPA per dropback of .14. He has a positively graded pass on almost 36% of attempts. However, his one glaring weakness is not avoiding costly turnovers as his turnover-worthy throw percentage is double what his big-time throw percentage is. Sam Darnold has struggled in all aspects of play but especially when under pressure. His 38.8 passer rating under pressure shows that he would be better off simply throwing the ball away each time pressure is registered. 8.2% of his attempts when under pressure have graded as a turnover-worthy throw. 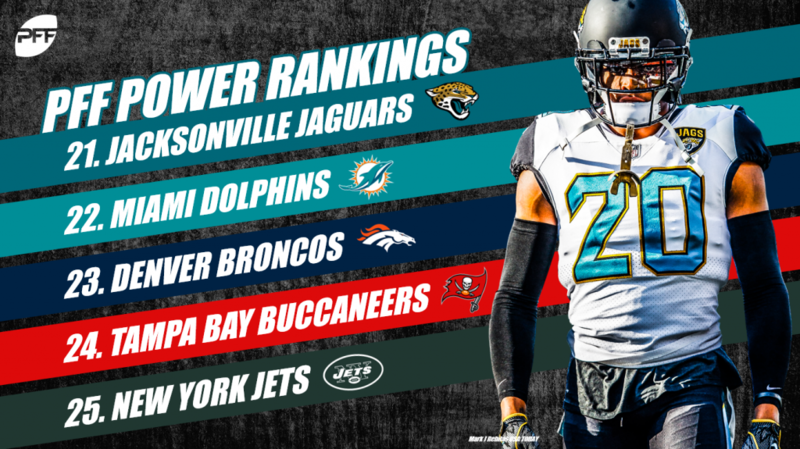 The Jets have the highest graded coverage unit in the NFL according to PFF grading. Still, they have struggled some on early downs and have allowed a successful pass on 50% of attempts. 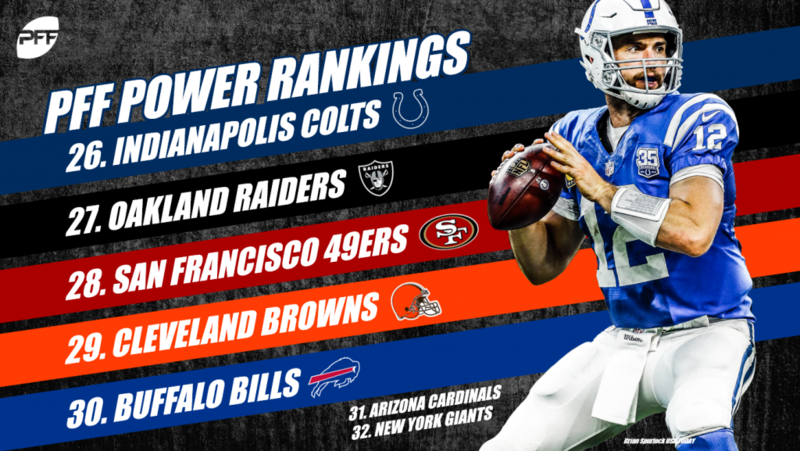 It took a matchup against the Bills for the Colts to finally flash the potential many expected of them in 2018. Andrew Luck had his best game since returning from injury, posting a passer rating over 150 while having zero turnover-worthy throws. Marlon Mack has the tenth-best yards after contact per attempt at 3.27. The Raiders performed a feat few teams are capable of by coming out of their bye week worse than how they entered it. Jon Gruden jettisoned Amari Cooper to the Cowboys and somehow got a first round pick back in this exchange. Gruden thinks he is playing the long game. Depending upon how quickly Gruden realizes Derek Carr needs to be a backup quarterback in the NFL will determine just how long he can play this game. Before going down for the season, Jimmy Garoppolo was under pressure on 45% of dropbacks. Things have hardly improved for C.J. Beathard as he has been under pressure on 36.6% of dropbacks. If they want to keep their franchise quarterback upright next season, they have to address the offensive line this offseason. The Browns suffered another heartbreaking overtime loss on Sunday. Baker Mayfield continues to play well from a PFF grading perspective. Mayfield has the second highest percentage of big-time throws in the NFL. The Pass defense which has received considerable praise is struggling from an EPA standpoint on early downs, allowing a successful pass on over 52% of attempts. Derek Anderson performed about as well as you would expect a 35-year-old journeyman quarterback to play. Their defense was the strength of this team through the first six weeks of the season but couldn’t stop either the run or the pass on Sunday. They allowed their highest EPA per pass attempt on the season while giving up over 3 yards after contact per rushing attempt. With Anderson at quarterback, it will be impossible to win games with their defense playing as bad as they did on Sunday. Josh Rosen struggled to take care of the football on Thursday night, throwing three turnover-worthy throws, resulting in two pick-6s in the first quarter. He now has the worst passer rating in the NFL among current starting quarterbacks when under pressure. Pat Shurmur absolutely made the right decision going for two down eight on Monday night. From an analytics perspective, it is encouraging to see teams make the correct in-game decisions. The hope is that this now carries over into their offseason personnel decisions. Right now the Giants are shedding salaries, trading away Damon Harrison and Eli Apple for peanuts. In the offseason, they were one generational talent away from being amongst the NFL elite, now that they have that player they appear to be in full on tank mode to hopefully find their franchise quarterback next offseason.